Gold stocks were the market’s darling during and just after the Great Recession, but they haven’t exactly glittered in recent years. Doom ‘n’ gloom, hyperinflation fears and other bullish catalyst for higher gold prices have basically subsided in the years following the financial crisis, leading to prolonged downturns for gold miners. Well, happy days are here once more. Worries about the global economy and impacts of various divergent monetary policies are finally beginning to have their effects on markets. Volatility is rising, and stocks are off to a historically bad start. Things aren’t good overseas, and they’re not great here either. Globally, the potential for a recession is at least worth considering. Quietly, gold prices — and gold stocks — have risen. Gold miners, as measured by the NYSEArca Gold Bugs Index, are up nearly 30% this year on gold prices that have increased by about 5%. Meanwhile, the S&P 500 has sank nearly 4% in 2016. Gold is finally giving investors the protection against a slumping stock market thanks to a big helping of fear. And if the market keeps seeing big drops like the Dow Jones Industrial Average’s 200-plus-point decline on Friday, gold will only continue to move higher. Here are six gold stocks to buy to get in on gold’s resurgence. Expect NEM to make it five consecutive quarters when it releases Q4 information on Feb. 18. That’s because Newmont has used the downturn to get leaner and meaner. NEWM has sold off non-core assets, reduced debt and lowered its production costs. “lean & mean.” The firm has sold off plenty of non-core assets, reduced debt and worked hard at reducing its production costs. NEM estimates that its all-in cash costs to produce an ounce of gold will be between $850 and $950 per ounce this year — better by $50 per ounce on the low end. Newmont, which is trading below book value, could be one of the best gold stocks to buy today — especially if gold prices continue on the upswing. It’s no secret that during the gold price rout, Barrick Gold (ABX) suffered. This large producer declined from a peak above $55 per share in 2011 to less than $6 in 2015. The problem: To become so large, ABX made some major acquisitions during the gold-price peak, which resulted in ballooning debt. However, like Newmont, Barrick Gold has gone on a cost-cutting spree, including selling a ton of assets and shuttering underperforming mines. ABX then turned around and repaid around $3 billion of its debts last year. Barrick still has about $12 billion in debt on its books, but management has promised to continue cutting into that debt and to reduce operating costs to do so. Oddly, that debt gives Barrick an edge over other gold stocks in that ABX is a leveraged play on rising gold prices. As gold has risen, investors have been buying in as if they think the turnaround is going to come much sooner than later, and ABX has risen much faster than its peers, up more than 50% in just about five weeks! Barrick Gold will continue to explode higher if gold maintains its northern route. Some of the deepest values for gold stocks can be found across the pond. AngloGold Ashanti (AU) is based in South Africa, so shares have had to contend with general emerging-market weakness as well as the malaise in gold stocks. But AU isn’t a garbage company. 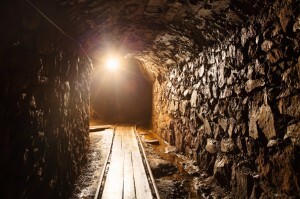 The gold miner has 19 different mines located across the world. The breadth of production — spanning from Australia to Mali — will help AngloGold prosper in the age of rising prices. Perhaps one of the biggest boons to AU’s bottom line and its share price could be the Rand currency. South Africa’s currency has plunged in recent weeks. That’s actually good for AU as it earns profits in dollars, but pays workers and costs in Rands. With the spread at some of the highest marks in years, AU should be able to realize greater margins on its production. When it comes to gold stocks, investors should care about “all-in cash costs” — a metric that determines whether a gold miner is making or losing money based on the current price of gold. Agnico Eagle (AEM) has one of the lowest all-in cash costs, reporting last quarter that it was producing at $759 per ounce, which bests even traditional low-cost rivals like Goldcorp Inc. (USA) (GG). While the firm has estimated that its cash costs should average around $820 for all of 2015, this year could be lower. Part of the reason is that AEM’s buyout of Osisko Mining and its Canadian Malartic mine in Quebec will be 100% cooking. That huge mining complex is one of the cheapest mines in the world, producing at $525 per ounce as of 2014, and AEM has continued to push production from it. Higher production and lower costs are a major win for AEM as gold prices keep rising. When it comes to gold stocks, Franco-Nevada (FNV) is a weird bird — because it doesn’t actually mine for gold, or anything else. That’s because it doesn’t actually mine for gold or silver. FNV is what’s called a royalty and streaming company. It owns gold deposits and allows other miners to produce that gold. Franco-Nevada also provides capital to struggling miners to get the ball rolling at other projects. FNV makes its money by simply collecting fees tied to production for either of these surfaces. So, Franco-Nevada doesn’t really carry the risks associated with rising mine costs, labor relations or environmental issues. But it still benefits when gold rises. What’s nice about FNV is that it puts some of that money back in investors’ pockets. Franco-Nevada has continuously upped its monthly dividend for years and currently yields 1.8%. Franco-Nevada has a brilliant business model and can serve even cautious investors looking at gold stocks. Perhaps the best strategy when it comes to gold stocks is to buy a bunch of them. Diversifying your holdings in gold stocks makes plenty of sense, as this rising tide really is lifting all boats. Almost everyone is seeing a price of the action as gold heads higher. One of the easiest and cheapest ways to get in on the action is the $4.9 billion Market Vectors Gold Miners ETF (GDX). GDX tracks all the gold stocks in the previously mentioned Gold Bugs Index, currently at 37 different firms. This includes everyone on this list as well as other industry stalwarts like Compania de Minas Buenaventura SAA (ADR) (BVN) and Yamana Gold Inc. (USA) (AUY). GDX has been obliterated during the gold rout but has bounced back in recent weeks as the economic uncertainty has taking hold and gold prices have risen. GDX costs 0.53% per year, or $53 annually for every $10,000 invested. For investors, the ETF might make the most sense for those looking for a hedge or play on the growing market chaos. Article printed from InvestorPlace Media, https://investorplace.com/2016/02/gold-stocks-aem-nem-gdx-gld-fnv-au-abx/.